But that wasnâ€™t in fact the case. The Tweet was an allusion to a McArdle essay on Bloomberg NewsÂ headlined â€œBeware of Blaming Government for London Tower Fire.â€ And while that piece does not in fact say that the deaths in Grenfell Towers were â€œtotally worth it,â€ it really is just about as unfeeling as Heer makes it out to be. Worse (from my somewhat unusual perspective), itâ€™s also a catastrophically bad piece of policy analysis. This is a case where the self-parody is even meaner than the parody. As someone who teaches and practices benefit-cost analysis, let me say that Meganâ€™s essay is the sort of thing that gives the rest of us cold-blooded, heartless bastards a bad name. To start with the facts. (Mike Oâ€™Hare has more here.) Grenfell Towers was a â€œcouncil estateâ€ (British for â€œpublic housing projectâ€) housing mostly refugees. It had about 600 residents, approximately 30 of whom died when the whole building went up like a torch. Roughly every fire-safety measure that could have been ignored was ignored: the building had no sprinkler system or external exits and its external cladding was of non-fireproof material. Replacing that cladding with fireproof material would have cost about Â£5000 ($6000). Money has alternative uses (including other safety measures). Sometimes safety trades off against convenience (e.g., in determining highway speed limits) and itâ€™s not obvious that the trade-off should always be made in the interest of safety. Benefit-cost analysis is the right way to make such decisions. Markets outperform governments in making such benefit-cost calculations. Point 5 seems to me a half-truth; there are disadvantages and irrationalities in private as well as public decision-making, and which is to be preferred needs to be resolved case-by-case. But itâ€™s on Point 6 that I want to say, â€œOh, come on!â€ In this case, you can do the relevant calculation on the back of the nearest envelope, and you conclude that whoever made the decision to clad that building in non-fireproof material made an obvious mistake. The cost of the safety measure in question (counting the value of any inconvenience or loss of amenity as well as money). The value of whatever that safety measure is protecting. So letâ€™s look at the fire-resistant cladding question. As noted, the cost of fireproof cladding would have added about about Â£5000 ($6000) or about $10 per tenant, to a Â£8.6m renovation project. The value of avoiding an early death â€“ based on actual market behavior with respect to wage premiums for riskier jobs – is about $10 million. (That’s a U.S. number; since the UK isn’t as rich as we are, you’d expect the willingness-to-pay for safety to be somewhat lower there.) So fire-resistant cladding would have been worthwhile if the it reduced the probability of the average tenantâ€™s death by one in a million. I donâ€™t know the rate of structural fires in high-rises (of course it depends in part on building codes) but even if we assumed what seems like a low value of one in ten thousand over the lifetime of the cladding, fireprooofing would only have to improve tenant survival rates in case of a structural fire by one percentage point to be cost-justified. C’mon! Ask me a hard one! So even if the Monday-morning-quarterback reaction â€œSomeone should have done something to prevent this! Letâ€™s figure out who that was and string him up!â€ is unjustified I general, in this case the reaction â€œWhat idiot used non-fireproof materials to renovate a tall apartment building?â€ is completely justified. Retro-fitting sprinklers in an existing building is substantially more expensive; to do that calculation precisely youâ€™d need more assumptions and a bigger envelope. What doesnâ€™t make any sense at all is the idea that somehow â€œthe marketâ€ can answer the problem. The eventual â€œbuyerâ€ of rental housing is the tenant. Do you really expect every tenant to learn enough about fire-safety engineering in the abstract, and the specific conditions of alternative units, to calculate the comparative fire risks of one unit compared to another, and factor that calculation in along with rent, amenity, space, and location in choosing a place to live? I mean, seriously? Itâ€™s obviously more efficient to have some experts make the calculations and establish appropriate minimum standards. Will that process work perfectly? No. Will it wind up forcing poorer people to pay for a little bit more safety than they really want (given the constraints they face and the alternative uses of that money) because somewhat more prosperous people are writing the regulations and casting most of the votes? Sure. But the idea of letting the distribution of sprinkler systems depend on the skill of sprinkler salesmen really doesnâ€™t pass the giggle test. So, even allowing for the benefit of hindsight, outrage about the negligence of the public authorities and their contractors in this case seems overwhelmingly justified. In 1968, the year I graduated HS, the motor vehicle death rate for 100K of population was 26.270. By 2014, it had dropped to 10.25. From 2014 to 2015, it rose rather dramatically to 11.324. Since the population of the US in 2015 was 321.4 Million, some simple arithmetic shows that over 48K were saved due to government regulation–auto design, road design, increase in drinking age, lowering of alcohol impairment levels for DWI, stricter enforcement of DWI laws, etc. And, the number of lives saved is likely actually greater than 48K since the percentage of people who had autos increased and the number of miles driven increased. The 2014 to 2015 increase is due to lax enforcement of anti-texting while driving laws. The bottom line is that regulation works. Yes, not all the time and sometimes inefficiently, but it has tremendous benefits. You haven't made the least attempt at a cost-benefit analysis here. About 200,000,000 cars have been sold with airbags siince 1993. At an average cost of $6,000 per vehicle for safety features, that is 15 billion dollars, or $25 million per life saved. I don't find it at all hard to imagine that this forced expenditure cost more than 48,000 lives from other causes. Where does your $6000 come from? And note that the calculation you do counts only lives saved. It does not include the benefit of reduced injuries. Besides the quite valuable benefit to the individual involved, this translates into lower medical costs, less time lost from work, and a host of other benefits. (Note that it is actually Tables 1.8 and 1.14 that show this figure.) If mandated safety features have reduced this total by .25% a year since 1993 the savings of more or less $24 billion far exceed the $15 billion cost you cite. Difficult to find good numbers on this. I ballparked the number based on the cost mostly of airbags. Could be those prices have dropped more than I thought. I did find an estimate for about half of that figure. http://www.accessmagazine.org/fall-2004/price-reg…. Even NHTSA does not seem to have projected a cost, which I thought was a requirement for regulations like this. But somehow they are quite capable of calculating a total savings, including "quality of life" savings that represent over two thirds of their claim, lol. They certainly don't show the loss of quality of life from sucking all those billions out of the economy, or the loss of automobile sales due to higher prices, or the increase in collision insurance cost, etc. The impossibility of such calculations is just another reason why the government should not interfere and should let consumers make their own decisions. Quality of life years – QALY's – are a pretty standard part of these kinds of calculations. You can quibble with the calculation – I often do myself – but I don't think they deserve an "lol." There is a real cost to being suddenly confined in a wheelchair, for example, or spending months or years in and out of hospitals, or even to lesser things such as being unable to pursue certain activities you enjoy. And of course injuries will often shorten life spans, even if the accident was not immediately fatal. But take the figure for pure economic loss – around $240 billion in 2010. How much higher do you think that would have been without the regulations? $1 billion? If $240 B is the economic savings from the regs, then I assume the cost would have been $240 B higher without the regulations. Unless I am missing something. The about $240 billion (actually $242B) is the cost of auto accidents, per the NHTSA report, when you count only economic costs, excluding Qaly's. See table 1.8 in the linked report. I'm not considering quality of life cost. It applies to both regulation and non-regulaton, and there's no reason to have confidence in benefit calculations from an agency that needs to justify its own existence. So you start by complaining that sltax has not done any cost-benefit analysis and end by rejecting any attempt to do so. You don't like QALY's, and you don't accept the economic cost calculation. So why ask about these things at all? On the off chance that someone might have a credible response? It is impossible to provide you with a credible response, since you take it on yourself to declare data you don't like invalid, and accept only your own out-of-thin-air $6000 figure. Do you honestly think NHTSA is just making up numbers? When it comes to evaluating the effectiveness of NHTSA, I am reluctant to accept their numbers at face value, yes. They have every incentive to bend the numbers in their favor. Perhaps there is an Inspector General looking over their shoulders somewhere, but I'm not familiar with what they may or may not have looked at in this case. Every organization in the world, government or private, for profit or not, wants to justify its existence. So for you there is no such thing as accurate data, and no such thing as a credible analysis, except the one you turned out using your own baseless figures. OK. I happen to think the data produced by government agencies tends to be pretty accurate (I'm sure you've got an example of bad data, but it won't prove anything). Unless you can point to systematic errors I'll go with it. Besides if you don't have any data, how can you criticize the regulations as not being cost-effective, which is where you started. I think I'm done with this dialogue. It's up to government to justify regulations, not up to citizens like me to justify opposing them. And they should do it before they impose the regulations, not come back with cooked up numbers ten or twenty years later. Perhaps the $6,000per car includes all safety features, such as seat belts, lights and brakes. In order to make the math work you'd have to start including things like shatterproof windscreens and structural strength and crumple zones. Things most sensible people would regard as integral to being a car, not as additional safety features. At some point the comparison is between a complete modern car and some sort of improvised rickety aluminum-framed jitney with the driver perched precariously atop a leaking, polluting engine, squinting into the wind. Sure, the latter is a lot cheaper to build, because it doesn't have all those safety features like seats and doors, nor any environmental controls like a catalytic converter or a muffler. But it's a terrible machine. I think that your basic math is wrong. Assume that the 15,000,000,000 figure for safety features is correct. Assume further, that these safety features saved "only" 48,000 lives. That's a cost of 15,000,000,000/48000 or 312,500 per life saved, not 25,000,000. But quite apart from your basic math, you make a fundamental error–The denominator is not 48,000. That's the number of lives saved in one year. You get your costs by calculating the costs over a 22 year period. If you make the denominator the number of lives saved over that same 22 year period, you see what a great investment this has been. Of course, I've used your assumptions which are deeply flawed. The cost of airbags is, based on the model car involved, anywhere from 1/6 to 1/2 of the $6,000 figure you used (and, yes, I checked). And, of course, you have to include all sorts of other costs: from collapsible steering columns and seat belts in the car, to the design of roads, to the costs of enforcing DWI laws. And, as I pointed out, the toll of lives saved for 2015 of 48,000 is likely lower than is actually the case since the proper way of looking at the issue is based upon miles driven not U.S. population. One small quibble: It isn't the poor people who will be living in these buildings who will be making the choices between spending on safety or spending on something else. That choice was made by the local and national governments (both Conservative at the relevant times). The Conservatives evidently thought that almost anything was preferable to spending on the poor, so providing good design and fire sprinklers was left to the best efforts of the free market fairy. The choices of the then mayor of London, Boris Johnson, were more tangible. Not only didn't he do end on the poor, he managed to screw everyone by closing many fire stations and seriously cutting the the fire service. But at least he spent the tens of millions of pounds wisely on preliminary studies of a garden bridge across the Thames. The case for reducing the level of fire service is much stronger than the case for reducing fire-safety regulation. Improved materials and designs (largely regulation-driven) and the decline of smoking in bed have so decreased the rate of residential fires that upwards of 90% of calls answered by very expensive firetrucks are calls for emergency medical service. What doesn't make sense is reducing fire service while also doing inadequate fire-safety regulation. Yes on the fire departments point, as Mark point out this is one of the more overbuilt parts of public service in many countries. The other point Mitch Guthman makes is also wrong — it is in fact the people who live in these buildings who make the decisions. Residents are the majority of the management association board, and this same group authorized a just completed multi-million pound renovation that sadly did not include a sprinkler system. Maybe you've seen this letter to the Guardian by a citizen of the area, telling of how the local government has built up a reserve in the hundreds of millions, while sending rebate checks to local taxpayers (those not living on public subsidy) – and while saving mere thousands by using flammable instead of fireproof decorative cladding. Hammurabi's Code, section 279, mandates the death penalty for a builder who negligently kills the occupant of his building through collapse. The public policy problem is 5,000 years old. As is the solution. Maybe not in that exact form. I fail to see the argument that the market – a real market, not some armchair fantasy – can make the tradeoffs at all. If you are not a party to the contract, your interests are only represented to the extent the parties choose to consider them, and understand them correctly. It is certain, perhaps a theorem, that all indirect representation is inadequate. 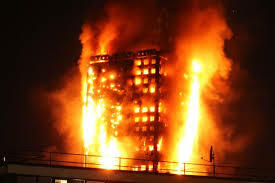 Do you really expect every tenant to learn enough about fire-safety engineering in the abstract, and the specific conditions of alternative units, to calculate the comparative fire risks of one unit compared to another, and factor that calculation in along with rent, amenity, space, and location in choosing a place to live? I mean, seriously? This is the absolute essence of the glibertarian free-marketism of McArdle and her cohort. They use this logic to assail all sorts of regulation, claiming that the 'free market' will sort out the good from the bad players. But this means that EVERY consumer must become an expert in everything, from choosing a place to live, to buying a car to deciding to take a drug or not. This is their mythical 'rational consumer' who knows all,sees all and can punish bad actors i the marketplace with their choices. Well, maybe, at least after the bad actors kill and maim enough people to make it noticeable. Regulations are there for a reason, and these glibertarians, who have benefitted all their lives from the actions of a significant, powerful and deeply entrenched regulatory regime, and apparently have absolutely zero historical knowledge, claim that because they see no upside but cost to these onerous regulations, they should be done away with. Of course this is correct, and it does not even address other objections to McArdleism. What of visitors? What of neighbors? Fire has a nasty habit of spreading in utter disregard of property lines. Where is the market solution for that? There is no need in this day and age for individuals to be an expert in fire safety engineering. Fire insurers have ratings and requirements (although they probably don't cover public housing). A government or an independent rating body funded by developers, or a crowd-sourced rating system could adequately inform prospective tenants. This is how safety ratings of automobiles is done now, in addition to minimum safety feature requirements. There is no perfect system. Fire safety inspectors are historically one of the most corrupt segments of the bureaucracy in the US. Thank you for reiterating some of the points I made in my comment on Michael's post on this subject. I hope this incident will help you understand why some of us hold McCardle in lower regard than you seem to. Herb Edelhertz, who wrote "The Nature, Impact, and Prosecution of White Collar Crime" in 1970, put it this way, "Caveat emptor loses its meaning when we buy bread in sealed packages." After reading Mike O'Hare's piece, I recalled an instance that clearly illustrated McArdle's thesis as being nonsense. In the late '80's I was in a law firm that leased space in a very nice building. The building had won major awards for architectural design when it was built. One day, there was a major electrical outage in the area. We discovered that we were trapped on the seventh floor because the fire exits were inside the building and had neither windows or emergency lighting. The result was a major inconvenience. However, that inconvenience would have been a disaster had there been a fire. What rational choice did I make in going with a law firm that was in a building that had a serious safety lapse? Let me ask any reader, including, presumably McArdle: Have you ever been offered a job and said: Before I accept, I want to to a safety assessment of the building I'll be working in? If people did not expect government to protect them at every moment, they would learn to notice basic stuff like emergency lighting. The whole point of government licensing is that collectively we can employ experts and impose regulations to ensure the proper handling of matters that we, as busy individuals responsible for living our own lives, don't even know to ask about, and would in any case be unqualified to assess the answers. This is even more the case when it become necessary to impose such regulations on some self-interested smooth-talking party who can make more money if only they can pull the wool over our eyes; contrariwise, such experts and regulations can give a project manager a defense against the unreasonable demands of an energized but poorly informed community. Quite serious. The government is taking huge amounts of money and liberty away with absolutely no empirical evidence that they are increasing public good, merely based on best case scenarios and wishful thinking. Who's pulling the wool over our eyes really? What do you do with a fraudulent business? You go elsewhere. What do you do with a fraudulent government? Add your vote (choice of 2 frauds) to the pile of 100,000,000 others. I am glad that neither one of us will ever suffer through living in the radical anarchist libertarian dystopia you crave. I would probably not be as well off under such a system, but the poor would be better off within a generation or two. Government has really stacked the deck against them for the last 50 years. If we could assume that the only significant thing that has changed since those days all has to do with legislation, and ignore things like technology advances and the increase in wealth since the mid-18th century, then you may have a point. But then I could point to China, which has liberalized and as a result raised the standard of living of hundreds of millions in a much shorter period of time than it took England. With increased wealth, people can and do demand better treatment of themselves and others. On purely utilitarian grounds, I believe liberty wins hands down. Just out of curiosity, have you ever negotiated a commercial lease? Do you have any idea what the cost of the negotiation would be in a "free" market? The UK also makes errors in the opposite direction. Following the Ladbroke Grove train crash, they spent billions of pounds on safety improvements expected to save something like one life per billion pounds spent. Maybe more rational if the goal is reducing the fears of the median voters rather than saving lives. I suspect fear is a preserved quantity. McArdle is hard-headedly practical on many issues, but she has some blind spots, and this is a good example. Another is her consistent defense of Big Pharma on almost every issue. It could be because the sites I read have a thing for finding and slagging on McArgleBargle's "blind spots", but I can't recall anything I've ever read of hers, that wasn't ridiculously comforting to the comfortable, afflicting to the afflicted. Could you point at some things that might make me think she isn't just a standard-issue right-wing hack? It's not so much that she is a defender of pharma morality as that she is a proponent of the idea that pharma's activities are a rational response to government policies and power. If you hand someone a monopoly, they are going to monetize it. McArdle has also claimed that the benefits of pharma development are so huge that it's worth letting pharma firms price-gouge Americans to keep the innovations rolling. If there weren't better ways to do it (e.g., prizes for development of drugs for specific conditions) I'd agree with her. How do you know there are better ways? Can you name an industry that was provably made more efficient by being managed governmentally? Sea navigation in the 18th Century. Without ths very large Longitude Prize offered by the British government, the solution would certainly have been delayed and many more lives lost. It's not a question of "being managed governmentally." It's a question of what incentives government provides. You yourself point out that pharma practices are a response to government policy, presumably patents among other things. So maybe there are better incentive policies, short of a government takeover of the industry. Is it a standard in public policy planning that the value of avoiding an early death is $10 million, for the purposes of doing calculations and analyses// i have been involved with reliability analysis of protective products for many years, but we could never put a dollar value on the lives being put at risk if a product was not as reliable as we wanted it to be. Also, you said that cladding would reduce the probability of an average tenant's death by one in a million. Did you mean to one in a million? This is the minimum standard we're required to meet where we're considering the possibility of death. Yes, $10M is more or less the standard number. See the work of Kip Viscusi. No, I didn't mean "reduce the chance of death TO one in a million." What could do that? I meant "have one chance in a million of saving that person's life." If the cost of fireproof cladding is $10 per person, and the value of preventing the death is $10 million, then you just need one chance in a million of preventing a death to make it worthwhile. I see. We look at product failure, and product failure resulting in fatality, as happening as a result of two or more independent events, rather than having one single cause, most of the time. Estimating the probability of each independent event occurring, then multiplying them together leads to the probability of the fatality happening. If we estimated that this probability was one in a million, or less, we were generally willing to accept that status quo. In the case of avoiding a fatality in a fire, the combination of proper building material, suppression devices, and safety devices for residents can lower the probability of a fatality to less than one in a million. All of them have to fail before someone dies.. The $10 million figure is based on what the average person is willing to spend in order to reduce their chances of early death. The problem is that it is an average. A poor person may not only be unwilling to pay as much as a wealthy person, but is also unable to pay as much to reduce the chance to a given level. Thus, if you require everyone to live in a maximally safe building, a lot of people will just end up living in no building at all, unless a way is found to subsidize them. I get an email notification of a response to my comment, but how am I supposed to find the comment. The "go to comment" link in the email takes me to a collapsed list of comments. I would suggest that fire protection is one of the last areas of which government should keep its hands off. Even if I had a neighbor I detested so much that I would welcome misfortune coming to him (never been the case, fortunately), one misfortune I would absolutely not wish on him is a home fire. Fires spread, and even my neighbor's didn't, the damage and repairs could scar my neighborhood for months or longer to come. Leaving this area to the private sector is about as sensible and keeping government out of the sanitary sewer business. Thanks for sharing such a great stuff. I always appreciate such a useful posting.